Deeply hydrate, nourish and repair hair with pure, organic rose water. 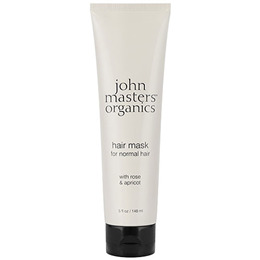 John Masters Organics silky, rich Hair Mask was developed with multiple benefits in mind: To help balance moisture levels, repair split ends, and cleanse the scalp. Ideal for normal hair, it’s the easiest way to maintain shiny, lustrous locks and a healthy scalp in less than five minutes. Rosa Damascena (Rose) Flower Water*, Aloe Barbadensis (Aloe Vera) Leaf Juice*, Glycerin*, Behentrimonium Chloride, Cetearyl Alcohol, Cetyl Esters, Prunus Armeniaca (Apricot) Kernel Oil*, Persea Gratissima (Avocado) Butter, Equisetum Arvense (Horsetail) Extract*, Chondrus Crispus (Irish Moss) Extract*, Hydrolysed Wheat Protein, Chenopodium (Quinoa) Seed Extract*, Leuconostoc/Radish Root Ferment Filtrate, Lactobacillus, Cocos Nucifera (Coconut) Fruit Extract, Guar Hydroxypropyltrimonium Chloride, Pelargonium Graveolens (Geranium) Leaf Oil*, Anthemis Nobilis (Chamomile) Flower Oil*, Citrus Sinensis (Sweet Orange) Oil*, Sodium PCA, Sodium Lactate, Arginine, Aspartic Acid, PCA, Glycine, Alanine, Serine, Valine, Proline, Threonine, Isoleucine, Histidine, Phenylalanine, Citronellol+, Linalool+, Geraniol+, Citral+, Limonene+. *Organic, +A natural component of essential oils. Apply generously on clean, wet hair from roots to tips, leave in for 3 to 5 minutes, rinse thoroughly. Use twice a week. If product enters eyes rinse with warm water. Below are reviews of John Masters Organics Hair Mask For Normal Hair - 148ml by bodykind customers. If you have tried this product we'd love to hear what you think so please leave a review.